Middle East Perspectives by Rick Francona: Intelligence reporting tailored to fit the Obama narrative? Intelligence reporting tailored to fit the Obama narrative? Was intelligence reporting by the U.S. Central Command (CENTCOM), the combatant command responsible for American military operations in the Middle East, skewed to fit more optimistic assessments of the fight against the Islamic State in Iraq and Syria (ISIS)? 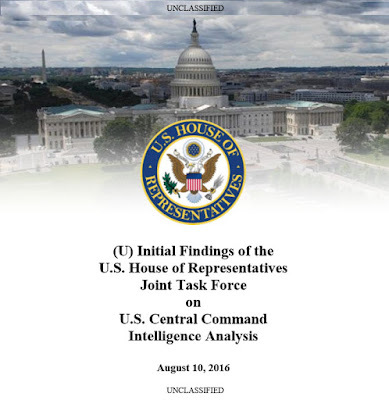 According to a report titled Initial Findings of the House Joint Task Force on CENTCOM Intelligence Analysis (read it here), it appears that it was. First, a few words - some by way of disclaimer and some by way of explanation. The men and women serving in the CENTCOM Intelligence Directorate, or the J2, are serious professionals performing a demanding and necessary function. I know - for nine months I was detailed from the Defense Intelligence Agency (DIA) to CENTCOM J2 in Saudi Arabia, Kuwait and Iraq during Operations Desert Shield and Desert Storm. When I was not performing duties as General Norman Schwarzkopf's Arabic interpreter, I worked in several positions within the intelligence directorate, mostly in a liaison role with our Arab allies. The Director of Intelligence at that time was U.S. Army Major General Jack Leide--airborne Ranger, combat infantryman, former defense attache in Beijing during the Tiananmen Square crisis - a no-nonsense soldier who you knew had your back. I saw him make some tough, unpopular calls--tailoring intelligence while American forces were engaging the enemy would not have happened on his watch. This Congressional task force report is damning. It should be - deliberately altering intelligence is unconscionable. That said, this should not be a reflection on the analysts at CENTCOM. In fact, it exonerates those who were brave enough to come forward and blow the whistle on the skewing of intelligence, or as we call it, "cooking the intel" to support a particular position or narrative. 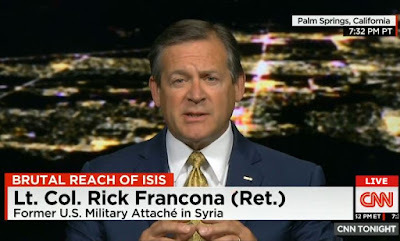 As many of you know, I am an on-air military analyst for CNN. I offer analysis and commentary to CNN's worldwide cable television audiences as well as provide input for other CNN reporting - it is a position I enjoy and hope that it provides useful insight to our viewers. However, no one is moving troops based on what I say on television. Conversely, the reporting by the CENTCOM J2 analysts is used by military commanders to do just that. Civilian leadership may use their analyses in making the decision to send young American men and women into harm's way. Having been in harm's way, I want the difficult decision putting our troops' lives at risk to be based on the best information possible - that requires accurate, unvarnished intelligence. When this issue surfaced a year ago, I wrote an article, Is your government lying to you about the war against ISIS? 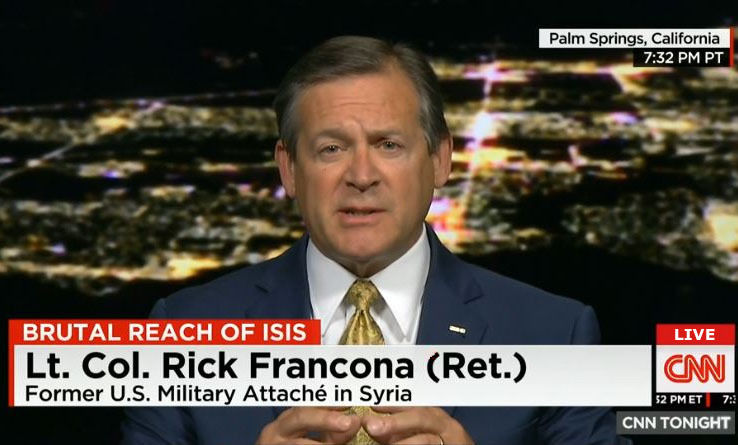 I also appeared on several CNN broadcasts with my fellow military analysts, all voicing the same concerns. All of our comments were--and remain--in line with the analysis in that article. As I read the Task Force Report, I was bothered by several things. Not once in the report is the name of the CENTCOM director of intelligence at the time of these alleged breaches of trust mentioned. When we are talking about skewed intelligence from an American combatant command and hoping to hold someone accountable, I would expect to see the name of that officer. The director of intelligence was U.S. Army Major General Steve Grove. In candid interviews, CENTCOM J2 analysts have used pretty harsh language about General Grove as well as the CENTCOM commander, U.S. Army General Lloyd Austin. They described the command climate as "Stalinist" and General Austin as an "uninspired political animal" seeking to curry favor with the Obama Administration. While General Austin set the tone for the command and is ultimately responsible for the alternate reality put forth by the command, most of the analysts singled out General Grove as the officer who directly altered their assessments of American efforts in Iraq, specifically the status of the war against ISIS. - CENTCOM intelligence analysts followed established best practices in the production of intelligence products. However, the senior leadership in the J2--that would be General Grove--edited the reporting to align more closely with claims from the operations personnel in theater. This is a common problem, and a dangerous one. Military personnel serving on the ground as trainers and advisers with Iraqi Security Forces made their reports, highlighting whatever successes were achieved by their efforts. However--and I have personal experience with this as a military adviser--these personnel are too close to the issue and often at too low a level to adequately assess the success--or failure--of particular programs and operations. - CENTCOM assessments of the success of U.S.-led coalition air operations were often more optimistic than information available via intelligence channels. At some point, intelligence reports were "softened" to fit the narrative that coalition airstrikes were having greater effect than being reported from reliable sources of intelligence information. This was especially egregious as coalition pilots were operating under strict rules of engagement and in many cases were not cleared to use their weapons, often returning to base without engaging available targets. The two stories did not add up. - CENTCOM's intelligence assessments, developed at CENTCOM headquarters at MacDill Air Force Base, Florida were often at odds with other elements of the U.S. intelligence community. Given the intelligence dissemination capabilities of the American intelligence system, for the most part all of the analysts throughout the intelligence community have access to the same information. Yet, CENTCOM's assessments were much more optimistic than other agencies. It is almost as though the command used whatever information was available to support the Administration narrative that ISIS posed much less of a threat than it did, and that CENTCOM actions were taking more of a toll on ISIS than they were. This is the very definition of "cooking the intel," telling decision makers what they wanted to hear. (U) The Joint Task Force is troubled that despite receiving the whistleblower complaint in May 2015 and receiving alarming survey results in December 2015, neither CENTCOM, DIA, the Under Secretary of Defense for Intelligence, nor [Office of the Director of National Intelligence] have taken any demonstrable steps to improve the analytic climate within CENTCOM. The survey results alone should have prompted CENTCOM and [Intelligence Community] (IC) leaders to take corrective action without other inducements. During interviews, however, multiple Intelligence Directorate senior leaders challenged the legitimacy of the survey results rather than taking responsibility for them. This is, unfortunately, characteristic of the IC’s response to the situation at CENTCOM: leadership within CENTCOM, ODNI, and DIA attempted to diminish the significance of the allegations and the survey comments, despite significant evidence indicating widespread problems with morale. DNI [James] Clapper downplayed reports of potential issues at CENTCOM, referring to them as “media hyperbole” and attributing the complaints to disgruntled analysts. These statements, and others, by senior IC leadership to downplay the significance of the incidents at CENTCOM were an inappropriate response from individuals charged with leading the IC in preserving analytic integrity. The new CENTCOM commander, U.S. Army General Joe Votel and his new director of intelligence, U.S. Army Major General Mark Quantock, have their work cut out for them. They need to restore confidence in the command and start providing realistic intelligence and operational assessments. They must tell the President what he needs to hear, not what they think he wants to hear. The big question, though, remains unanswered. Who, if anyone, pressured General Grove to alter the intelligence to fit the Obama Administration narrative. Was it General Austin, someone at the Department of Defense, or someone at the White House? That person must be held accountable for this debacle.